I'm not able to execute "rake db:prepare" on command line but - as answered on stackoverflow - it's not recommended to use it this way. Instead of "bundle exec rake task" should be used. But even if everything is working as expected on CLI, Rubymine compains about missing gems and tests cannot be executed as well. Why is that necessary and where should I tell Rubymine which environment must be used when starting rake tasts and so on? I did it already by picking the right gemset in Menu / Settings.... Are there any temporary files which contain the wrong values? on the screenchot you have provided "Apply" button is enabled and this make me think that you have not set sdk for the project, so I'd suggested to doublecheck this. I'm opened for discussion and ready to change this as soon as I will be sure that this is a redundant requirement. I opened the Settings dialog again and it looks like this (see setting_sdk.png). I didn't do anything. Is it defined properly now? As you can see multipart-post-1.2.0 is specified explicitely in Gemfile and I ran "bundle install" from the command line before. Do you have any ideas? Should I remove all the ".idea" specific stuff from the directory and re-import the directory into IDE? Could you please check settings of the run configuration you are runnig. you are right.. and I'm confused as well. 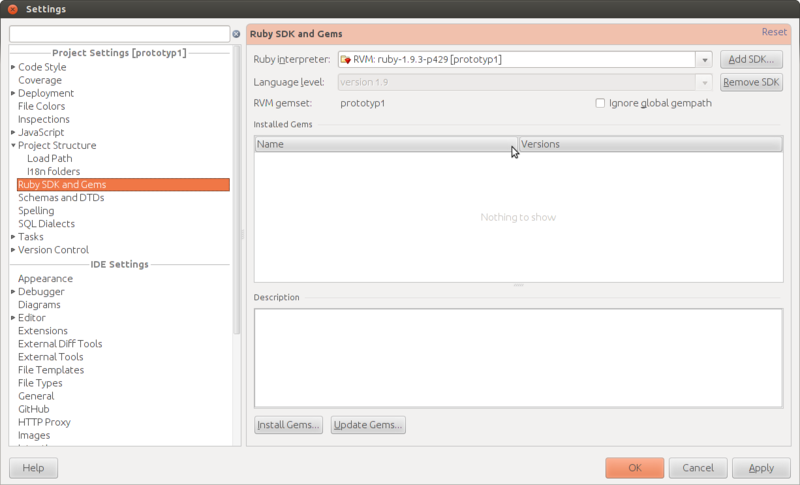 I opened the SEttings dialog again and there was another ruby gemset again (-p194). I DONT know why. 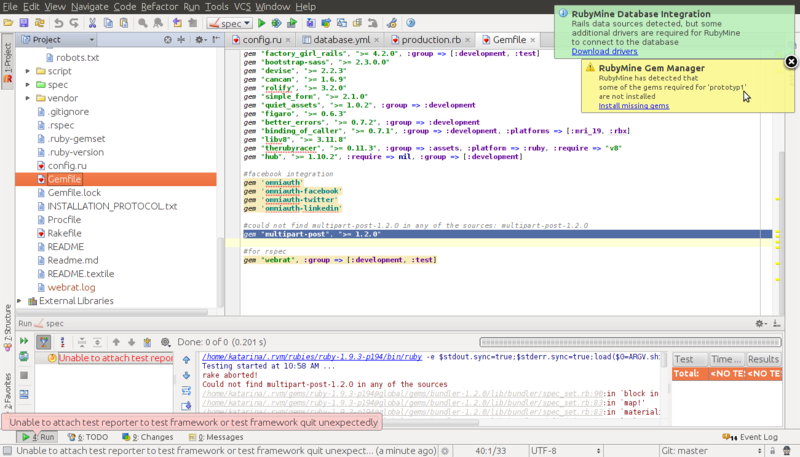 I put the value -p429@prototyp1 and currently I'm able to execute the tests. Sorry for this confusion. My issue is resolved now. Great, I'm happy to hear that the problem is fixed now.